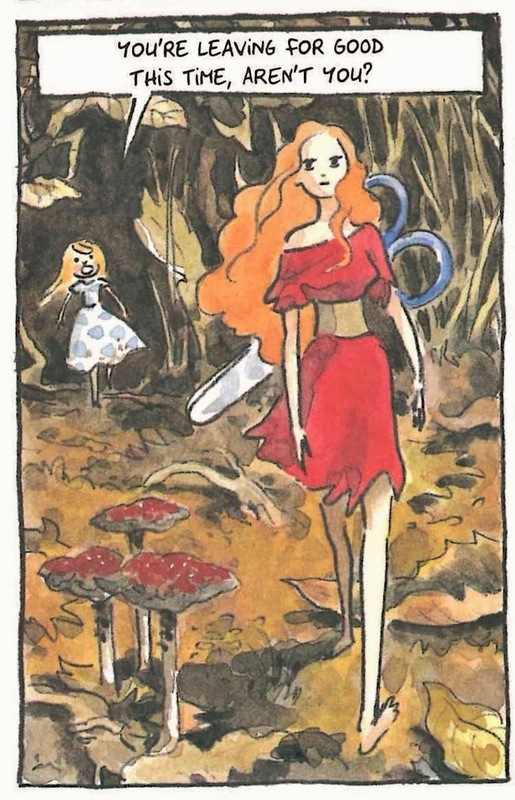 It's been pleasing over the last few weeks to see the amount of coverage Beautiful Darkness has received- and by now you may have read some of the litany of comparisons made in reference to its story: Miyazaki, Lord of the Flies, The Borrowers, Alice in Wonderland, Tove Jansson's Moominland. 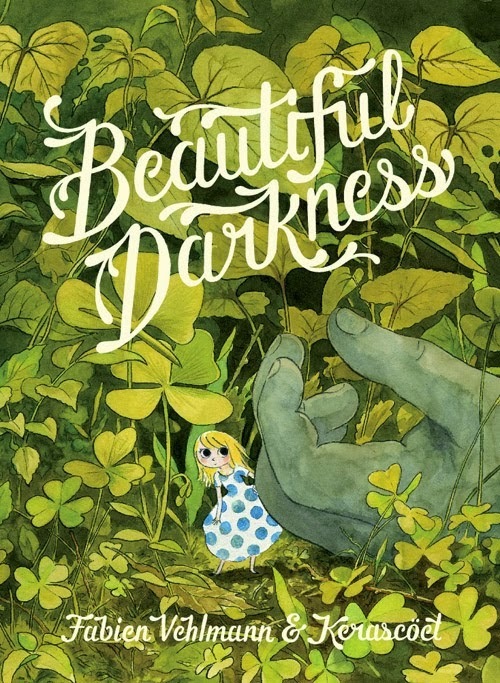 But Beautiful Darkness isn't simply deft juxtaposition of cutesy, attractive drawings meets dark subject matter; it's an almost casual study of how easily, how naturally people revert to a base survival instinct, the roles and groups that develop and the question and cost of holding onto one's humanity. The tiny folk in Beautiful Drakness are of various sizes, some are large: doll sized and some are minuscule: smaller than a ladybird. It's winter and a band of them seem to have been displaced from somewhere else, and struggling for survival, but have found shelter in the corpse of a young girl (that isn't a spoiler, by the way, it's ostensibly a premise, shown in the preview here). 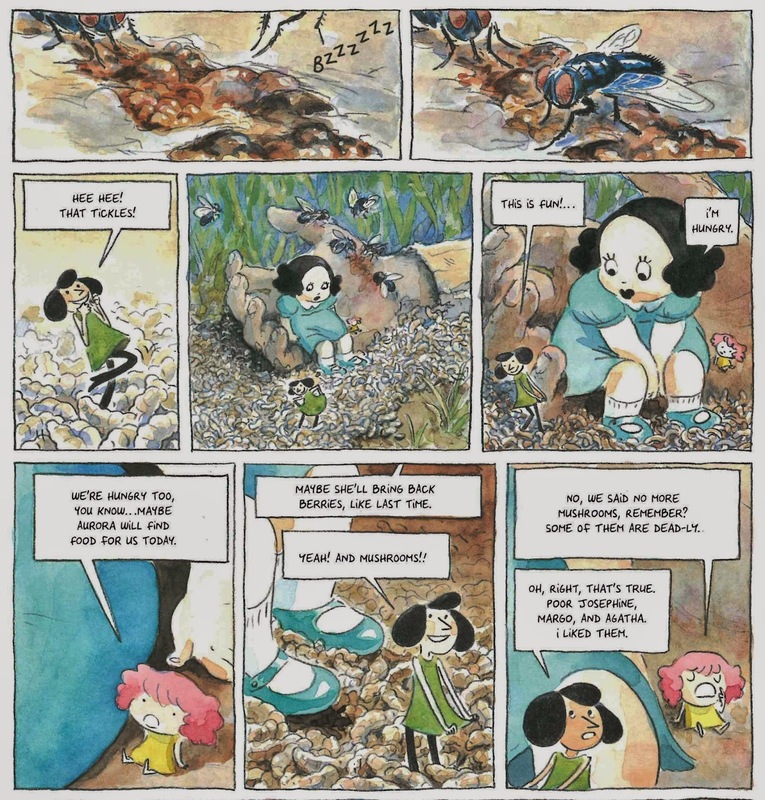 Other than being immensely creepy, for the reader the corpse is ominous- a young girl lying dead in the woods- the implications are sinister, but the tiny folk are oblivious- they don't know what humans are or what a young girl is, they only know safety and warmth. But the corpse is rapidly decomposing, caving in and invaded by other occupants and so they're forced outside into the woods themselves, where the real fight to stay alive begins. Our main protagonist, Aurora is a princess-like figure, truly good, organising the people, going out to find them food which she then distributes, making sure everyone is comfortable, helping those who are hurt. The problem is Aurora can't be there watching them all the time, and the tiny folk are hungry, scared, susceptible and guilelessly cruel -a dangerous combination. They eat one another in a off-hand manner, are scared of the insects and mice around them, yet are quick to pounce and pluck off limbs if they can, viewing their actions purely in self-preservation terms, but generally lacking any sort of introspection, almost as if they don't want to think about what they're doing. They're inherently feral in nature; whether they were always like this, or have become so due to harsh times is unclear. Certainly Aurora is different, foraging for food diligently, making wary allegiances with the mice and animals, exercising kindness and patience. But the good are always tested, and if they can't be gotten rid off, must be broken down. As Aurora's people descend increasingly into degenerate ways, led by the sadistic Zelie, she is faced with a choice: assimilate or die. She tries to extract herself from the situation by leaving, only to be followed by the rapidly dwindling troop, where she is again presented with the same choice: become one of them or suffer the consequences. It's a bleak ideology, a choice most of us are faced with in some form at some point in their lives: to what extent does one compromise one's ideals and principles, one's self before losing it entirely? Where do you draw that line that keeps you on the right side of being? How much do you slowly shuffle it before you realise you've been on the other side all along? Aurora doesn't want to compromise herself, her humanity, who she is, but Vehlmann doesn't allow her the luxury of remaining unsullied. There is no choice in making choices; none of us stay unchanged. Kerascoët have always drawn the prettiest, most pleasing to the eye art, in Hubert's Miss Don't Touch Me, in Beaute, and the deliberation of pairing those visuals with the horror within Beautiful Darkness is further enhanced by these cherub-faced little folk apparently not knowing what they're doing: bouncing joyously around on a sea of maggots working away at the girls' corpse, casual panels where the tiny folk are sat on decomposing hand or nestling in an eye socket, a background that often goes un-noticed until you look a little closer and realise what that is (fun fact: even knowing the premise of this book, I didn't realise that large hand Aurora's peeking out from on the cover is the dead girls' hand)- that's where the book is so well written: in the normality, the everyday-ness of the awful things going on, coupled with the casual obliviousness of those enacting them. Kerascoët and Vehlmann are slyly clever in directing your attention to these instances, making you look and then look again, at what doesn't compute at first glance. 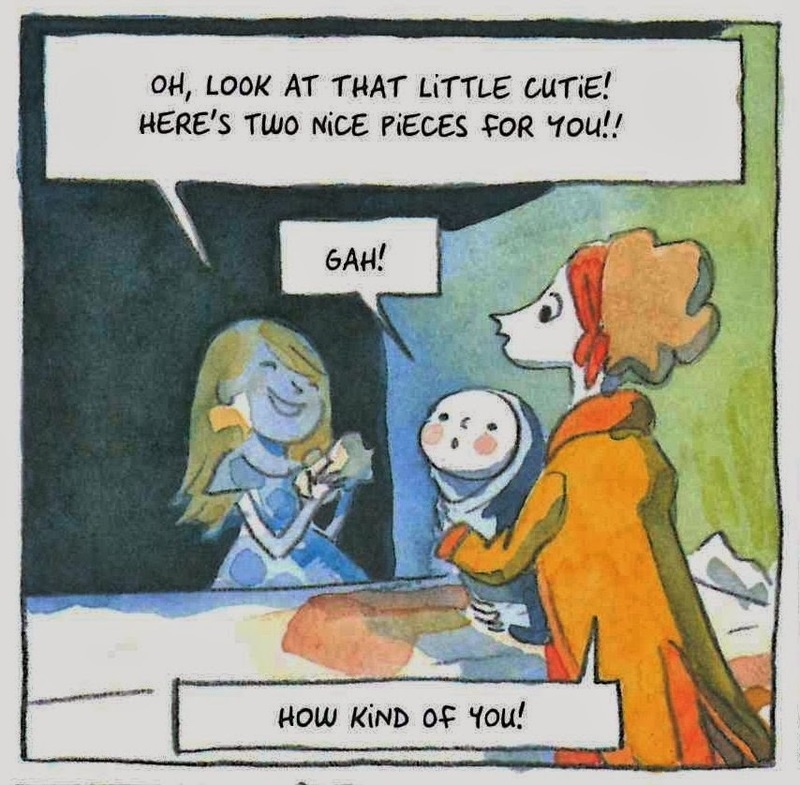 One of the facets I liked was how the differing sizes of the tiny people empahsises their character; Zelie gets steadily bigger and more threatening, like a mad queen, Jane is slim and tall, a statuesque warrior queen, Aurora, fairy-like, as her name indicates, very much a princess. One of the 'tinies' who stays on in the girl's body becomes increasingly, disgustingly bloated as she eats. It's interesting, also, to note how that plays into the commentary on the politics of leadership, the contrast in styles and the response from the populace: Aurora- proactive, sympathetic, caring, but perhaps not always available, Zelie- hard, ruling through fear, tyrannical, obsessed with the appearance, the trappings of power, servants, costumes and dis-interested in her subjects, the mad queen, and the only one to show deliberate, calculating cruelty. Jane, whilst capable, marches to her own drum, refuses to get involved, living separately. The people switch swiftly from Aurora to Zelie; fear is a greater motivator than kindness and rebellion a trying effort. In fact, they don't seem to even mind being harshly ruled, as long as they're given some scrap of an offering and know their place. Beautiful Darkness for all its aesthetic appearances- and indeed probably due to them- is a smart and caustic reminder that superficial veneers need not be stripped away for the worst to us to be exposed; a wry pondering whether humanity is something of an over-reach for the back-up system that is the essentially animalistic nature of man. 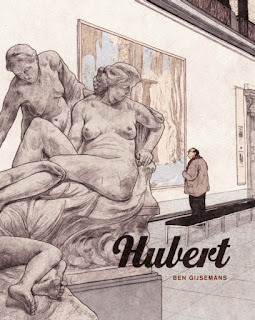 EDIT: I wrote an accompanying, in-depth essay titled 'Deconstructing the Horrific and Humane in Beautiful Darkness' for Comics Alliance, which examines the book in greater detail.